Roger’s Cup Tennis: Stefanos Tsitsipas’ game seems better rounded and more aggressive than Novak Djokovic’s. 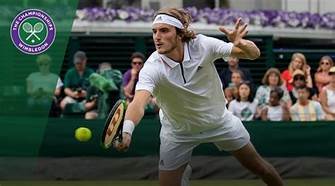 Stefanos Tsitsipas subdued Novak Djokovic 6-3, 6-7 (5) 6-3 in the third round of the Roger’s Cup in Toronto yesterday. Djokovic and Tsitsipas practice together. Practicing together should have given Djokovic an advantage over Tsitsipas. How many times has a top-ranked, GOAT caliber, player, like Novak Djokovic, lost to his practice partner? Isn’t the more experienced player supposed to size up the younger, less experienced player better in practice hitting and then use that understanding to dominate in the real matches? Unlike those high on Novak’s kool-aid, I believe he played very well to produce, a respectable, 32 winners. Tsitsipas, however, to Novak’s dismay, came up with 42 winners of his own and never let off the pressure and aggression. The match was dominated by Stefanos’ variety and aggression, whereas Djokovic played his usual baseline game, attempting to grind Tsitsipas into making errors. Stefanos Tsitsipas can play aggressively. Executing winners from behind the baseline line is not aggressive tennis. 138mph’s definition of aggressive implies taking the ball early and on the rise while creating an opportunity to move inside the baseline and towards the net by the fourth or the fifth shot. Roger Federer plays that style when playing his best tennis. Tsitsipas took the ball early and capitalized on the opportunities to advance to the net and end points. The advantage of a single-handed backhand. It is advantageous to sport a single-handed backhand to truly excel at that style and Stefanos, either by luck or design, has a single-handed backhand which, at 19, is superior to Roger’s at the same age. Novak lacks the skill to move aggressively to the net. After many years under Boris Becker, Novak has improved his net approaches a little, but they are still not world class. His game, essentially, is a baseline grind, developed to out-grind, the likes of, Rafael Nadal. And, Novak has been quite successful at out-grinding Rafa. Unless Novak can learn to move aggressively towards the net he, in our books, will be a semi-aggressive player at best. And, the semi-aggressive player can do little but hope for the aggressor to make mistakes. The game is always on the aggressor’s racket and will depend mostly on whether the aggressive player is having a good or bad day. Stefanos, the better player, outplayed Novak. Stefanos outplayed Novak. He is better than Novak in all aspects except the return and ability to grind. Djokovic, however, will still be able to grind Tsitsipas into losing, but the match, however, will usually be on Tsitsipas’ racket and Novak will have to rely on Tsitsipas errors to win. ← Tennis: Wawrinka overcomes an injured Kyrgios while Djokovic tames lucky loser Mirza Basic at Rogers Cup in Toronto.